I am in the middle of setting up a new gallery blog so will link to that later this week. The gallery is one year old this week so we will be launching the website to celebrate this. how exciting!!! It all looks gorgeous! Can't wait to see your website too. 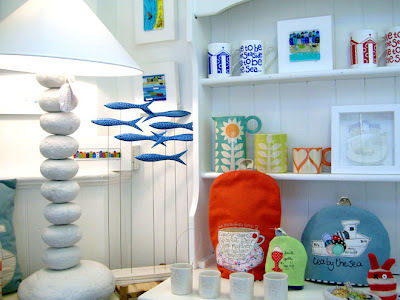 the gallery shop looks absolutely gorgeous with lots of tempting things! How wonderful! I love your work and I can't wait to see what you have in your shop. I'm sure I visited your shop a while ago when I was visiting my family in Aanglesey! Anyway, look forward to seeing the new gallery website. Just found your blog and love your stuff. Beaumaris is a lovely place. I'm dead jealous!